MILWAUKEE (August 20, 2018) – Celebrating 115 years of freedom and the city’s most-iconic brand, Milwaukee-based craft breweries – Third Space Brewing, Good City Brewing and Milwaukee Brewing Co. – developed the Harley-Davidson 115th Anniversary Milwaukee Lager. The crisp, balanced, hand-crafted beer is set to debut over Labor Day weekend during Harley-Davidson 115th Anniversary Milwaukee Celebration. The limited edition beer is a light golden color lager with a bright and slightly fruity aroma. It is brewed with all Wisconsin malts, grown right here in Milwaukee, and traditional German Hops that provide a light bitterness with a very refreshing finish. The can’s design features the limited edition, tattoo-inspired denim paint scheme and eagle design created for this milestone anniversary, which is currently available on select 2018 models. 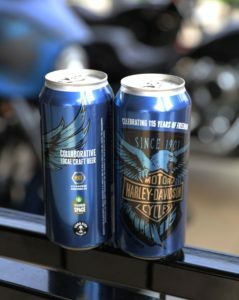 The Harley-Davidson 115th Anniversary Milwaukee Lager will debut at the Harley-Davidson 115th Anniversary Milwaukee Celebration, including at events located at Veterans Park and the Harley-Davidson Museum. The light, crisp, revved-up beer will also be available in 4-pack, 16 oz. cans at retail locations and bars across the state of Wisconsin, while supplies last.